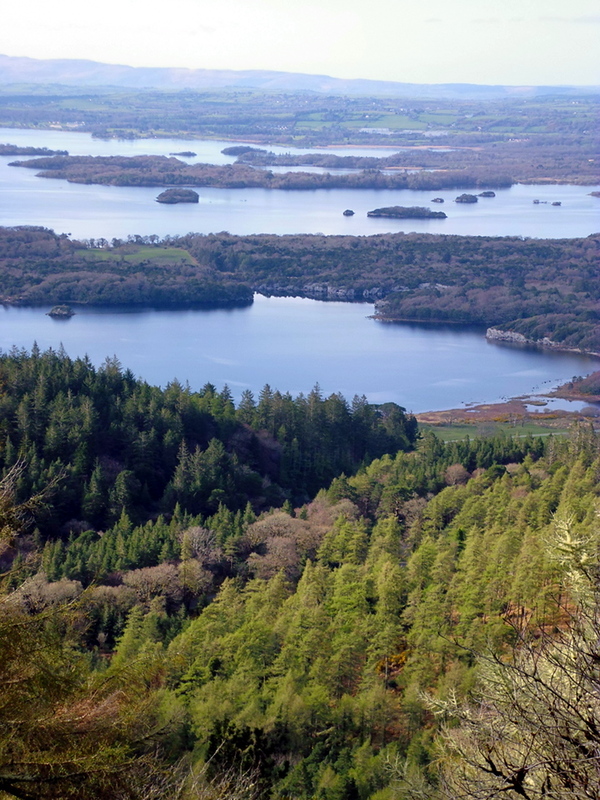 “The devil from the top of Mangerton mountain was firing big lumps of land at O’Donoghue over in Ross Castle”, Killarney boatmen will tell you. “On top of Mangerton there is now a big hole with a lake and the piece of land is Devil’s island” – which is shown in the first lake in the photograph. We are standing at Faill a’ Crann (the cliff of the trees) at the cul de sac, the highest point on the forest roads on the western side of Mangerton. On the 1:25,000 ordnance survey map of Killarney National Park it is just below Barnancurrane. It is just over an hour’s walk from Gallan Eile. The basin for the two lakes was gouged out by a two million year movement of a 500 metre deep mass of ice. The light green trees in the foreground are the needle shedding larch. Why have so many of these died in recent years? The dark green conifers further down are primarily Douglas fir introduced from California to this part of the world some 150 years ago. Between larch and fir is a gorge with a micro climate of its own. Torc Waterfall – which is at its most awesome during or immediately after very heavy rain – is at the head of gorge and across the Owengarriff River the Douglas fir include some of the tallest trees in Ireland. Immediately behind the car park there are specimen European larch and along the park road a little way up, in to the left/east, is a very fine Scot’s Pine. The Muckross Peninsula – which runs east/west between the two lakes – has the largest yew wood in Europe. Near the peninsula’s northern shore – to the right/east out of photograph – is Friar’s Island near which it is said the friars from nearby Muckross Abbey dumped their valuables in the lake when they were fleeing from Cromwellian forces. A number of friars were martyred at the time. At the south western end of Ross Island – the large peninsula sticking out into the lake – there are the remains of 4,500 year old copper mines, said to be the oldest in north western Europe. Off the end of Ross island you can see a part of Innisfallen island where the oldest contemporary account of the history of Munster was written. Students at the university here included Brian Boru our most famous high king – who drove the Danes out of Ireland at the Battle of Clontarf in 1014. The white building, above the eastern end of the lake near the top of the photograph, is the Liebherr factory employing a thousand people in one of the largest container crane factories in the world. The high ground behind is the holy hill of Agahdoe and along the skyline is the beginning of the mountains that are the spine along the entire length of the Dingle Peninsula. All of that from one point. An ideal two and a half hour walk from our holiday home at Gallan Eile. An aggressive sika buck boldly strode across a neighbour’s lawn about 7.30 this morning. In the early hours of last Wednesday or Thursday I heard the sika buck’s triple, whistle-like, mating roar for the first time this year. This will continue until November. 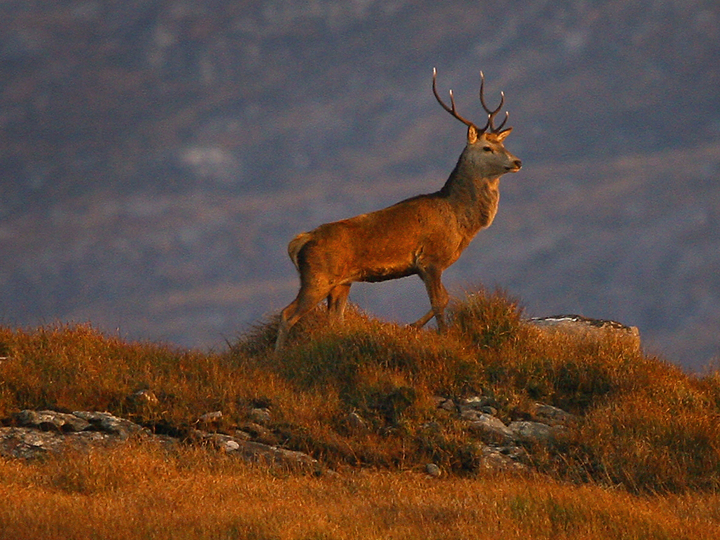 For the month of October the bull-like mating roar of the Irish red deer stag will reverberate in Killarney hills and woodlands. The red deer is the largest native Irish mammal and has survived since the end of the ice age only in the Killarney valley. Walking the mile and a half from Gallan Eile to the foot of Mangerton Mountain this morning the top of the stone wall is covered in heather in full bloom. The purpely pink ling heather dominates but it is attractively interspersed by the darker purple bell heather and a very occasional, ground-hugging yellow Autumn furze. The flowering heather gives Mangerton a purple hue. It might be remembering the great battle here in 1262 when the gaelic McCarthys defeated the Anglo Norman Fitzgeralds and kept south Munster in the control of the old order for a further 300 years. The McCarthys were the Kings of south west Munster. As well this morning a variety of small birds sang and sang. Since mid July they have been silent, hidden away in the bushes during their annual moult. There is no song from blackbird and thrush who are busy raising young. The smaller birds are not singing to entertain but to warn off intruders. Defending their feeding ground – to the death if necessary. This is a matter of life or death for them and their young who are now most vulnerable. Along the road to town the leaves of a horse chestnut are a wonderful array of yellow, brown and red. Killarney woodlands will show a rich cloak of Autumn colour from now until late november – weather permitting. I had my first sea swim this year in Fenit last Saturday – my first in Muckross lake only three weeks ago. As a heron flies overhead here at Gallan Eile all of the signs are good for a great Autumn.